Digger is a story about a wombat. More specifically, it is a story about a particularly no-nonsense wombat who finds herself stuck on the wrong end of a one-way tunnel in a strange land where nonsense seems to be the specialty. Now with the help of a talking statue of a god, an outcast hyena, a shadow-being of undeterminate origin, and an oracular slug she seeks to find out where she is and how to go about getting back to her Warren. With an irreverant sense of humor and a fantasy protagonist with a healthy dose of skepticism, Digger rapidly gained a huge following of devoted fans eager for the twice a week updates on the webcomic anthology site Graphic Smash. This volume collects the first two chapters of the story, along with an all-new six page comic revealing the origin of the talking statue of Ganesh. Digger has long received acclaim from fellow artists and webcomic critics. Barb Lien-Cooper, creator of Gun Street Girl, says: "Digger is sort of what you'd get if you forced a mating between Bone and Cerebus and then had the offspring's godfather be Terry Prachett." Eric Burns of the commentary blog Websnark says: "...unlike most 'unlikely heroines,' you honestly get the sense that when Digger makes it home, she's going to go to bed, get up the next morning, apply for an Engineer's job and get on with a proper sort of life, thank you anyway." Webcomics Examiner's Best Webcomics of 2004 says: "Digger is...a unique entity, blessed with stunning black-and-white art, a wry sense of humor, and one of the most engaging protagonists in webcomics." 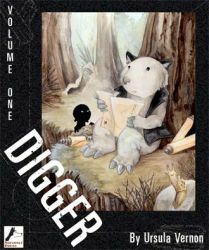 In June 2005 Digger was nominated for three categories in the 2005 Web Cartoonists Choice Awards: Outstanding Black and White Art, Outstanding Anthropomorphic Comic, and Outstanding Fantasy Comic. On July 10th it was announced that it had won the Outstanding Black and White Art category.